In 1951, staffing company pioneers Lou and Gwen Snelling dramatically changed the way companies and job seekers connect. They founded the company Snelling and Snelling based on the philosophy of “helping others achieve the success they desire.” They opened their first office on Market Street in Philadelphia, PA and by 1967 had expanded to 50 offices. In 1992, after decades of success and expansion, Snelling moved its headquarters to Dallas, TX. In February 2005, Patriarch Partners, a Lynn Tilton company, made a strategic investment in Snelling, a partnership that Snelling benefits from to this day. While rapid-fire change presents infinite challenges, it also presents infinite opportunities – but only for those that understand that “business as usual” is not a success strategy. Snelling offers solutions that come from an understanding of the position itself, but also the strategy for the workforce and the company itself. CUSTOM WORKFORCE SOLUTIONS are about maximizing the position opportunity, the workforce opportunity, and the long term return on your hiring investment. We offer custom workforce solutions tailored to your needs—including direct hire, temp to hire, temporary and on-site staffing. The talent gap is not coming, it is already here. CEO’s, HR VP’s and hiring managers struggle daily with the challenges of finding the right resources for the long term outlook of their organization. Competition for qualified talent will only grow more fierce in the coming years, and every company will need to plan for it. Can your staffing company help to close that gap? Partner with the nation’s premier staffing company. The Patriarch Partners family of companies is a group dedicated to Lynn Tilton’s vision of growing and sustaining American jobs. The idea of CUSTOM WORKFORCE SOLUTIONS is critical to achieving that ideal. Understanding and acting upon all of the nuances that bring the perfect candidate into alignment with the perfect opening is what we do. It does more than make us your staffing company of choice; it makes us your strategic partner. The Snelling team has a keen understanding of the competitive landscape, expert connections, and industry knowledge that gives us true understanding of the hard and soft skills required for every position. We also understand the critical importance of the company cultural nuances and other intangibles that must be considered. These concepts are some of the many ways in which we differentiate ourselves from other staffing companies. Snelling is proud to work with military veterans. You’ve served your country,now let our staffing company serve you. Leadership, commitment to teamwork, a strong work ethic and other qualities honed in the military are truly valued and in high demand among the local and national employers that trust us to find great candidates for a variety rewarding opportunities.  In 2016, Snelling received Inavero’s coveted Best of Staffing award in recognition of our exemplary customer service—an honor bestowed on less than two percent of staffing companies in the industry.